Some texts and art works that highlight the obfuscation of transmission in a multi-cultural and new media world and well worth having a look at. A book generated by processing the Audiobook version of Don Quixote through speech recognition software. After training the speech recognition software to recognize the voice of George Guidall - the narrator of the audiobook, the recording was played to the computer. The resultant text was reformatted to once again be a book. intervention into the English subtitles of Oliver Stone’s Platoon. The regular subtitles slowly are replaced with text from Mark Satin’s 1968 underground besteller Manual for Draft-Age Immigrants to Canada. Cheddie, Janice. 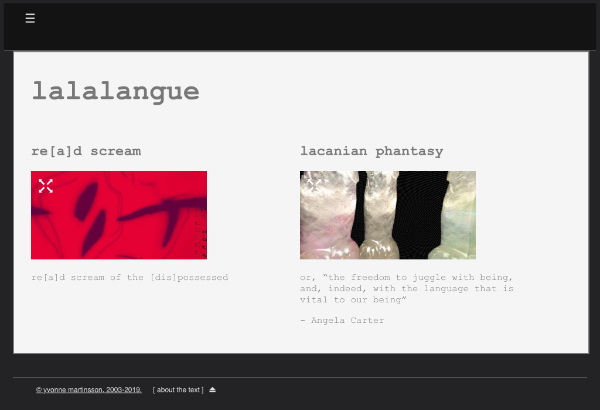 "Translation, Transcodification, Transmission: Erika Tan’s Pidgin: Interrupted Transmission." Leonardo Electronic Almanac, vol. 12, no. 7, last accessed 13 Mar 2007, www-leoalmanac.org/journal/Vol_12/lea_v12_n07.txt. Long, Gareth. "Platoon / Manual for Draft-Age Immigrants to Canada." garethlong.net, last accessed 12 Feb 2007, www.garethlong.net/platoon/platoon.html. Long, Gareth. "Don Quixote." garethlong.net, last accessed 20 Mar 2006, www.garethlong.net/donQuixote/donQuixote.html.